OCMC News - This Thanksgiving, Thank God for the Gift of Your Orthodox Faith! 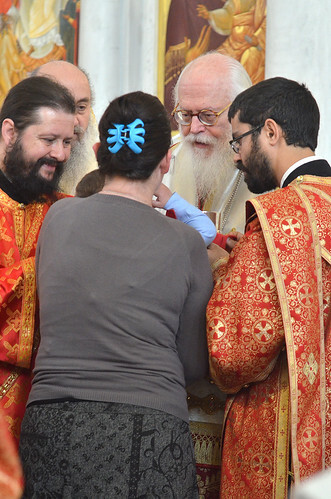 This Thanksgiving, thank God for the gift of your Orthodox faith by helping dear people find the joy of our faith! Help to build and strengthen our precious Orthodox Church in Albania, and around the world! Albania tears me apart. Most people would never understand why. But you’re not “most people.” You love our Orthodox faith. You’ll completely understand why my heart breaks for Albania. That’s why I’m writing to you today. I’m looking for heroes. People like you who are ready to help make Albania a different kind of place — alive with Orthodoxy that keeps on growing. Filled with Christians joyfully receiving the Sacraments. Living the life God intends for them and their families. Our Orthodox brothers and sisters. Yes, your donation today can help that come about! Your generosity will make such a difference! On the surface, things are looking better in Albania than they have in a long time. The streets are lined with busy shops and restaurants. People are well dressed. The economy is finally starting to improve. But something is wrong. There’s a sadness, an emptiness, on many people’s faces. You see, three out of every four people in Abania are not Orthodox. Most are Muslim or atheist. Beautiful Orthodox churches dot the cities and towns. But so many people never go into them. They don’t enter heaven in the Divine Liturgy. They don’t represent the cherubim. They never receive the Holy Gifts. Don’t get me wrong: The churches in Albania are growing. Life-long atheists are finding the faith. Even Muslims are discovering the truth and becoming Christians. But too many are following the path of Western Europe: To live dedicated only to making money and having fun — instead of live in their faith. To walk away from God. To exist without the holy and life-giving Sacraments and life in the Church. How sad! After hundreds of years of Ottoman oppression that left Albania a Muslim majority nation. Then 50 years under a violently anti-religious Communist regime that almost managed to erase the Church. Even now, becoming a Christian can cost them their job, their community, even the love of their family. Now they’re free to live a life in Christ. But they choose not to. And they grow more spiritually cold every day. It’s not inevitable. You can help draw these people into the Church — especially the young people. They are so ready for God’s love! Please — will you send a special Thanksgiving gift today? It doesn’t take a large amount to support your missionary work. Your donation now will equip our OCMC missionaries and staff to strengthen the Church. To help Albanian clergy and laity regain knowledge that was lost under Communism. To support a vibrant Church that attracts people. That can face the challenge of Islam. To rescue people form drifting into materialism. I’ll admit, I really love Albania. I served there for six years. I grew close to so many wonderful Albanian people. Now my son, Stephanos, is serving there as a Deacon and missionary, along with his wife Alexandria. We have eight missionaries serving there. But as you know, we work all over the world. Your giving to OCMC supports the Orthodox Church — especially places like Albania that need outside help. Your donation is a powerful way to express your Orthodox values. And to help draw people into our Church who otherwise might never now about it! Like Saints Cyril and Methodios, our patrons, your dedication can change the world. I hope and pray that you can send a gift today! P.S. This Thanksgiving, I urge you to celebrate God’s gift of our precious Orthodox Church — given to you and me and so many others — by helping spread that gift.